Metal Maniac recently conducted an interview with ANNIHILATOR mainman/guitarist Jeff Waters in Paris, France. You can now watch the chat below. ANNIHILATOR's 14th studio album, "Feast", sold around 800 copies in the United States in its first week of release. In a recent interview with Ghost Cult Magazine, Waters stated about "Feast": "As an artist, you're sometimes lucky when it all comes together, be it painting, singing or whatever. Sometimes you want to do something good and when you're busy with it, you seem to hit the nail on the head. When you listen back, it doesn't contain your best work. Sometimes it just works. Bands like IRON MAIDEN, JUDAS PRIEST, SLAYER and also we in ANNIHILATOR have great records and we have our share of not-so-good records. Different times, different places, you know. Maybe we were lucky with 'Feast' and maybe we were inspired. 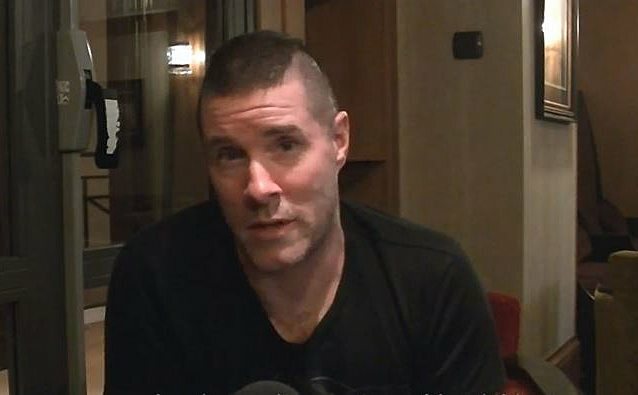 A lot of it comes from that my partner in ANNIHILATOR, singer/guitarist Dave Padden, said that we should take a break for three years from writing music and focus on other things. We did a lot of touring, I worked in my studio, give guitar clinics for Gibson and Epiphone and we played the 70000 Tons Of Metal cruise, all these cool things. The break breathed a lot of new life in the ANNIHILATOR music and that's probably where a lot of the inspiration came from." Asked how his working relationship with Dave Padden has developed over the years, Waters told Ghost Cult Magazine: "When Dave came in 2004, he was just 'another' singer. We had a lot of different singers and musicians in the band throughout the years. Looking back, every singer was good for the time they were in the band and without them things would have been much different. When Dave joined the band 10 years ago, things were different, because he was a guitar player and not really known as a singer. When he auditioned, I really liked the versatility of his voice, so I decided to give him a chance. I stuck with him and worked with him long enough to see him developing into a killer guitar player and singer live. He's a very talented guy. He came from being scorned and criticized to becoming an integral part of some of our best albums. After four or five years, I realized he became more of a partner and I start phoning him to ask for his input on touring, equipment and endorsement deals. So we're half a band nowadays; you get two out of four. [laughs]"